It's been 45 years since the Rev. Martin Luther King Jr. was assassinated during a sanitation strike in Memphis. Workers are still carrying on the civil rights leader's great struggle for economic justice today at waste facilities and fast food restaurants. 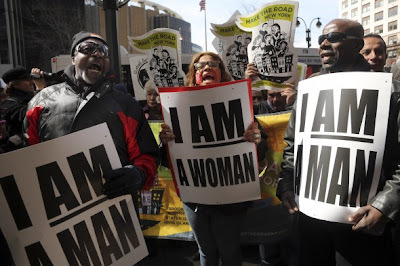 "Several pickets wore signs that said “I am a man” or “I am a woman,” echoing placards carried in Memphis in 1968." Monroe Gallery of Photography is pleased to represent the Ernest C. Withers Collection. Please visit us in Booth #419 during the AIPAD Photography Show through April 7.